The wait has been long, but the new Honda Navi has proved to be worth it. It’s not every day that two-wheeler manufacturers take a chance to offer something completely out of the ordinary. Especially, when we’re taking about traditional companies like the Honda Motorcycle and Scooter Limited (HMSI). And its days like this, when motorcycle enthusiasts like you and me have hope when we wake up in the morning. Honda Navi is a surprisingly radical approach by HMSI, which combines the best of both scooters and motorcycles in a two-wheeler. So look closer and you’ll recognize plenty of parts borrowed from various motorcycles and scooters Honda sells in India. We’re not sure if Honda has coined a name for the segment that this puny looking motorcycle-scooter mix would fall into. How does Moto-Scoot sound? Not surprisingly, on Honda’s official website the Navi is neither listed under the scooter section nor the motorcycle or Superbike tabs, but the company has decided to dedicate a new section simply named – Navi. It’s 5.25am and we’re already at the shoot location – curious, excited and can hardly wait to get a go on the new Honda Navi. 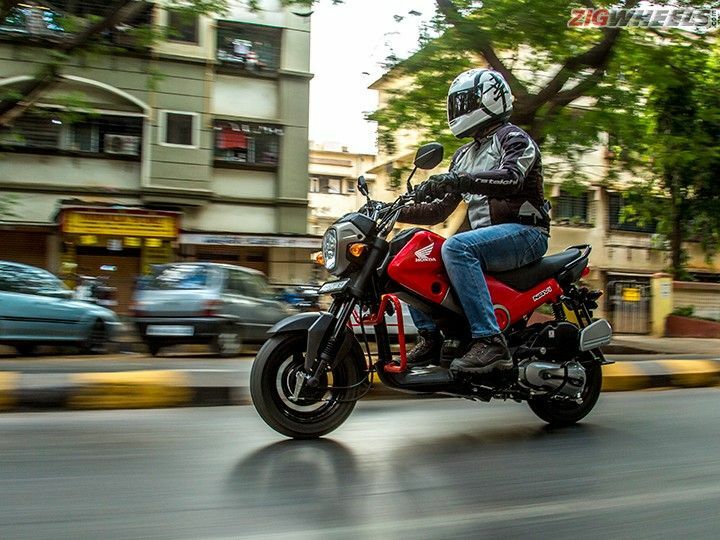 These are feelings that are usually associated with much larger sportsbikes, but Honda has managed to generate the right hype round this super-compact moto-scoot which packs a tiny 110cc motor whisking out 8PS power and 9Nm of torque. Oh! And neither does it have any gears. Just a CVT to power its 10-inch rear wheel. Obviously, the unconventional design has played a big role in the hype. Just look at the bike. Its proportions make it really adorable. The single piece tank and side panels in vibrant colours, extra-long seat overlapping the fuel tank and a gaping hole underneath it instead of the customary engine. It’s unusual in every meaning of the word. Then there are these smaller design elements which accentuate the fun aspect of the Navi. Just like the black and textured plastic part running through the center of the tank and faux carbon fibre on either sides. The wheels, forks, engine and exhaust have been finished in black and look premium, but keeping muck and dirt off all of them could be a nightmare for bikers suffering from OCD. The hexagonal headlamp, like the instrument cluster is all-new. But other bits like the taillight has been taken from the Honda Stunner 125, which somehow manage not to look out of place. It’s really interesting how different parts of the Honda Navi comes together seamlessly to create something young, fresh and attractive. Well, there aren’t many unique features to talk about on the Honda Navi. It gets telescopic forks in front, and a 12-inch wheel borrowed from the Activa 125. How we would have loved to see alloy wheels to go with this trendy mini-bike. Also common is the side mounted mono-shock rear suspension, seen on all Honda scooters. A simple analog instrument console reads out the speed and kilometres, and has telltale lights for indicator and headlight high-beam. Though there’s plenty of room but it doesn’t sport a fuel gauge. But it does get an old-school fuel knob on the side panel which can be twisted from Main to Reserve. While we’re on the topic, the Navi thankfully has the fuel filler cap conventionally positioned and is not under the seat, and comes with a plastic lid for protection. Coming from Honda’s commuter motorcycle parts bin is the familiar switchgear which as usual doesn’t have a kill switch, but surprisingly does not included a headlight pass button. There’s a choke conveniently located near the horn switch, and you get self-start and kick-start, like all scooters available nowadays. There are dozens of accessories which one can opt for. So, one can further customize the Honda Navi into a scrambler theme or something basic like installing a box to fill in the void under the fuel-tank. We feel Honda could have given a foldable hook there to hang small bags which would have improved the Navi’s utility further. Getting astride the Honda Navi is another revelation. The tall handlebar, seat and footpeg geometry makes the riding stance like any average basic motorcycle. The tank nicely fits between the legs and offer adequate grip, so there a sense of surety which inspires confidence while riding. You’ll be surprised how the designers have managed to make the Navi appear more compact than it actually is. If you place a Honda Dio next to it you’ll notice that the Navi is not just longer (by about 25mm), but also wider (by 38mm) and even the wheelbase is longer by about 48mm. In fact, the two siblings have identical saddle height. Yet, the Navi feels slightly taller because of the wider seat that makes the riders leg part further away from the bike. It has chunky footpegs like a motorcycle, and it takes a couple of minutes to get used to the missing foot controls (remember no gears?) and once you overcome that that Navi feels like riding a conventional motorcycle. Slightly smaller, more compact but surely comfortable. The long seat carves out just about enough space for the pillion. But the rear footrests are slight forward set, making the pillion’s feet brush against the rider’s legs while crawling in traffic. Another thing which looks odd is the handle lock, which is on the side of the front forks. This should have been integrated into the ignition key, to make the Honda Navi slicker. The key can also unlock the seat, which has a small cavity underneath to store knick-knacks. This would have been great to store and charge mobile phones, only if the Navi had a charging option to offer. The Honda Navi is basically a mini-bike with a scooter’s soul. And the sole is its 110cc single cylinder, air-cooled petrol engine. Though the unit is taken from the popular Honda Activa scooter, on the Navi it produces slight more power. This plus the fact that the Honda Navi is lighter by a few kilos (thanks to the all-plastic body panels) make the moto-scoot a spirited ride. Power delivery is instant and linear. Honda is known for its refined motors and the Navi is no exception. Using HET (Honda Eco Technology) the engine feels smooth and loves to be chug between 40-50kmph. But twist the throttle and the mini-bike is quick to gain momentum, making overtaking easy. Beyond 60kmph some vibration gradually creeps in and the scooter tends to max out at close to 85kmph. This, by the way, is more than sufficient for city use. Even with two adults onboard the Navi doesn’t lose steam and continues to offer brisk acceleration for its size. Another thumbs-up goes to the braking system. The drum brakes in front and rear do a tidy job of bringing the bike to halt, with adequate feel and feedback. This is even without the option of Combi Braking System (CBS) on the Navi, which would have further helped anchorage. But Honda could have improved this further by offering a disc brake variant too. During the photoshoot, many inquisitive passersby did mistake the Navi to be a new electric scooter. Wonder if this could be food for thought for Honda? Honda products are often well engineered and things are seldom left to chance. The Navi’s ride and handling dynamics are proof of this. Although the bike has been conceived using parts and underpinnings of various other Honda two-wheeler models, the Navi is a well-engineered product. Single or with a pillion, the mini-bike manages to ride over average road undulations without losing composure. The front forks of the Navi make its ride better than the Honda Activa 3G, helping it overcome broken roads with ease, but it does tend to get bumpy over more severe broken roads. What really makes the Navi a joy to ride is its nimble handling. It has a really small turning radius, so you can make quick turns or maneuver through traffic without breaking into a sweat. This really compliments its compact size and urban commuter image. The Honda Navi is priced at Rs 42,824 ex-showroom Mumbai, which is an astounding proposition for this nifty little bike. But add to this price the taxes, registration, insurance and the necessary accessories (side stand, number plate etc.) then it leaps up to Rs 49,500 on-road. Which by no means is bad pricing, but obviously doesn’t sound as attractive. The fuel tank is rather small at 3.8-litre, as most scooters offer close to 5.5-litre. We expect the light and efficient Honda Navi to offer a fuel efficiency of close to 50kmpl under normal city riding conditions. This would give the mini-bike a range of under 200km, which will make your trips to the petrol station more often than you would’ve liked. The Honda Navi comes together as a fun bike, breaking boundaries and stereotypes. But it’s not for everyone. Not everyone is ready for the unusual and to shed inhibitions. A bright mini-bike concept can be a little too funky for many. Not surprisingly, the Honda hasn’t received as overwhelming response in terms of bookings as yet. Perhaps people are still trying to understand the idea of a mini-bike. Probably once the Navi becomes more common sight on the road more Indians might just buy the idea – that the Honda Navi is not meant just for the youth but for those who live young and who live free. I think we’ve heard that somewhere else too.